A few days ago I took a drive by the cute little house with awnings on the corner of Rio Vista and Pennsylvania in a neighborhood called Rio Vista Estates. This time I actually turned down Rio Vista Circle and drove the loop. Rio Vista Estates is a quiet enclave of less than twenty homes in Bonita Springs, Florida. 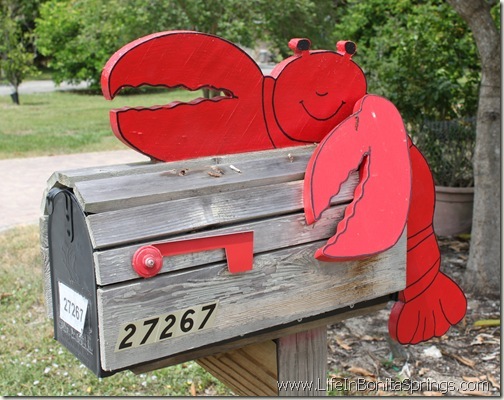 I found the cute little lobster mailbox back in Rio Vista Estates and I met a neighbor toward the back of the street. He has quite a homestead. 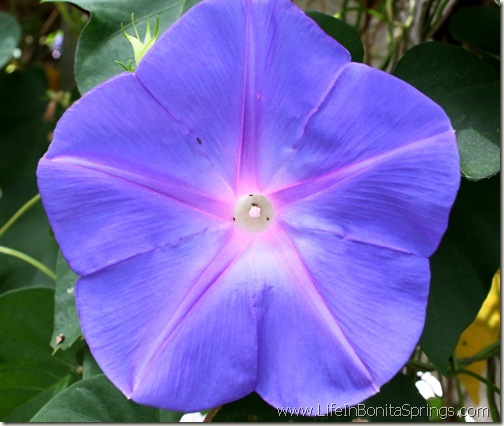 There were morning glories growing over trellis which caught the attention of my camera. It turns out that it’s a wildlife and butterfly haven in Rio Vista Estates. There were birds and squirrels everywhere and even ducks. A couple of wounded ducks from the Imperial River know that there’s easy grub to be found. It’s very quiet in Rio Vista Estates and water from Oak Creek and the Imperial River border two sides. Since Rio Vista Estates is a “one way in, one way out” community there is very little car traffic, too. Rio Vista Estates is located beside Nuttinglikit Grove near Riverside Park in Downtown Bonita Springs, Florida.